Anthony Kevin Dungy is a Jackson, Michigan-born former professional American Football player as well as a coach in the National Football League (NFL). Born on 6th October 1955, of African-American descent,he is perhaps best known for being the head coach of NFL team the Indianapolis Colts from 2002 to 2008. He was active in the field of American Football from 1977 until 2008. A well-recognized personality who spent almost four decades in American Football, one may wonder how rich is Tony Dungy at the present? As estimated by sources, Tony counts his net worth at an amount of $10 million, as of mid-2016, amassed being one of the accomplished professional football players, and a coach for NFL teams. He has also added to his net worth being an analyst on NBC. Raised in Michigan, Tony was interested in football from his school years. He started playing at college level when he attended the University of Minnesota as a quarterback – later, he was signed by the NFL team the “Pittsburgh Steelers” as a free agent. Tony played as an NFL player for only four years before retiring in 1980 to become a coach. During his career as a player, he, along with his team became the winner of the 1978 Super Bowl. He was also included in the “NFL 2000s All-Decade Team”. In 1980, now retired Tony began his career as an assistant coach at the University of Minnesota. Only a year later, he was signed by the Pittsburgh Steelers as a defensive backs coach, where he later worked as a defensive coordinator. All added to his net worth. 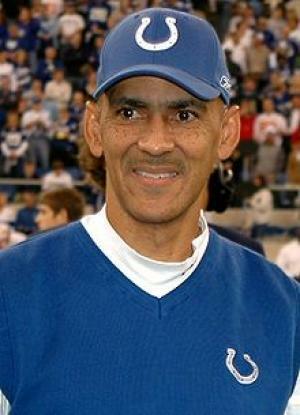 Eventually, after years of serving as a defensive backs coach, Dungy was signed by the NFL team the Tampa Bay Buccaneers in 1996 as their head coach. After five years, he moved to coach the Indianapolis Colts as the head coach. When working with the Colts, Tony became the first African-American head coach to win the Super Bowl. At the time, the Colts won the Super Bowl XLI against Chicago Bears where Lovie Smith was their head coach. He retired from his coaching career in 2008. Obviously, his career as a coach as served significantly in adding millions of dollars to his net worth. Given his contributions in the field of coaching, Tony was honored by “Indianapolis Colts Ring of Honor” in 2010 by the team. Moreover, he was more recently inducted into the Pro Football Hall of Fame in 2016. Apart from being successful in the field of football, Tony has also gained some popularity being the author of The New York Times bestselling book namely “Quiet Strength: Principles, Practices and Priorities of a Winning Life”. He has written a total of six sports and children- related books until today. Regarding his personal life, the 60 years-old former footballer has been married to Lauren Harris since 1982 – they have seven children. He identifies himself as an evangelical Christian. For now, he enjoys his life as a retired NFL player, and as an author while his net worth of $10 million caters to his daily life. 1 Inducted into the Pro Football Hall of Fame in 2016 as a coach. 9 He and his wife, Lauren, have six children: daughters Tiara and Jade, and sons James (deceased), Eric, Jordan, and Justin. 10 Won the Super Bowl twice as a player and head coach. 11 Oldest son James died on December 22, 2005. 12 Coach for the NFL Tampa Bay Buccaneers (1996-2001) and Indianapolis Colts (2002-Present). 13 Defensive Back for Pittsburgh Steelers (1977-1978) and San Francisco 49ers (1979).